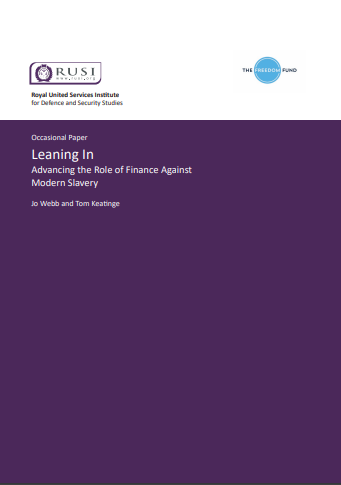 string(1144) "Resource Centre > Uncategorized > Leaning In: Advancing the Role of Finance Against Modern Slavery"
This report on modern slavery and financial institutions by the Royal United Services Institute for Defence and Security Studies and the Freedom Fund considers the role that the financial sector can play in reducing human trafficking and modern slavery through exerting responsibility and leverage. In recent years, the financial sector has become an increasingly high-profile contributor to efforts to identify and disrupt modern slavery and human trafficking. But can this commitment from the financial sector go further – beyond financial crime compliance and transaction monitoring – by using the provision of finance as a force for good to effect change in the operational and value-chain behaviour of their clients? This paper evaluates whether more action and commitment are required – and whether this is possible – from the sector, particularly in the form of using leverage provided by the provision of finance to clients to encourage the raising of standards in the field of human rights, in line with activity on environmental risks.